Answering Innovations answers live calls for veterinarians because, like the people who call into our answering service, we too are proud pet owners. We know what it’s like to call into the animal hospital when our beloved pet is sick or injured, so we make sure our answering service operators are well-versed in dealing with often frazzled pet owners and know how to speak with calm reassurance. Whether a pet owner is calling into the veterinary hospital to ask their veterinarian a question or report an emergency, our professional telephone answering service operators are trained for the job and Answering Innovations can handle it with ease. We’ve been in the business since 1977. Experience has prepared us for everything. Answering Innovations can handle the overflow when your receptionists are busy. We can be your after hours support. Or, we can be your one stop shop for all your live call answering needs. Our call center agents are available twenty-four hours a day, seven days a week. When a pet owner calls your number, one of our operators will answer with a smile. You will never miss another call or another opportunity to capture new business; customers will never again reach your voicemail, which can cost you business. 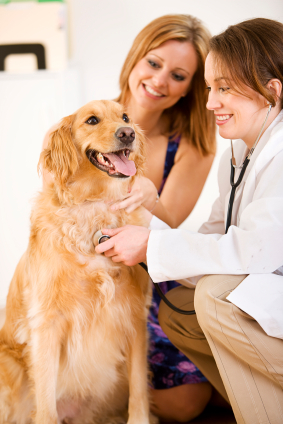 Our sterling performance helps veterinarian practices retain their current customer base too. As partners, we become a seamless extension of your veterinary office. Unless you’d prefer otherwise, callers won’t know the difference between our answering service operators and your receptionists. Account setup is fast, easy, and 100% customizable. At Answering Innovations, we strive to work closely with our customers to forge partnerships. To start, we’ll ask you how our live answering service operators should greet incoming callers. Next, we will work together to build a custom script for your veterinarian clinic that our call center agents will utilize during each call. Need to add special instructions? No problem. Since Answering Innovations uses a powerful and dynamic scripting software package, and since Answering Innovations has a wealth of experience dating back to 1977, you can rest assured that our answering service operators can handle any special needs you can throw at them. If it involves the telephone, we can do it! In the case of an emergency, our answering service operators will confidently assure the pet owner that an on-call veterinarian will be notified. We will escalate through each contact method you provided us in order of your preference until we reach your on-call staff. All the messages our call center agents take can be delivered to you by your communication choice of preference—email, text message, fax, pager, straight to your cell or smart phone, etc. It’s up to you. A live voice will pick up, not voicemail. Every time.